Lanta Meng, a contemporary Vancouver artist, received initial art education in her native Taiwan. She was encouraged to develop drawing and oriental brush painting skills at an early age. She immigrated to North America in the 1970s and studied at the San Francisco Academy of Art College. She continued her Fine Arts degree at the Emily Carr Institute of Art and Design in Vancouver in the early 80s. Her areas of study included etching, lithography, pottery, painting and drawing. Lanta approaches painting as a way to crystallize personal memories and experiences. 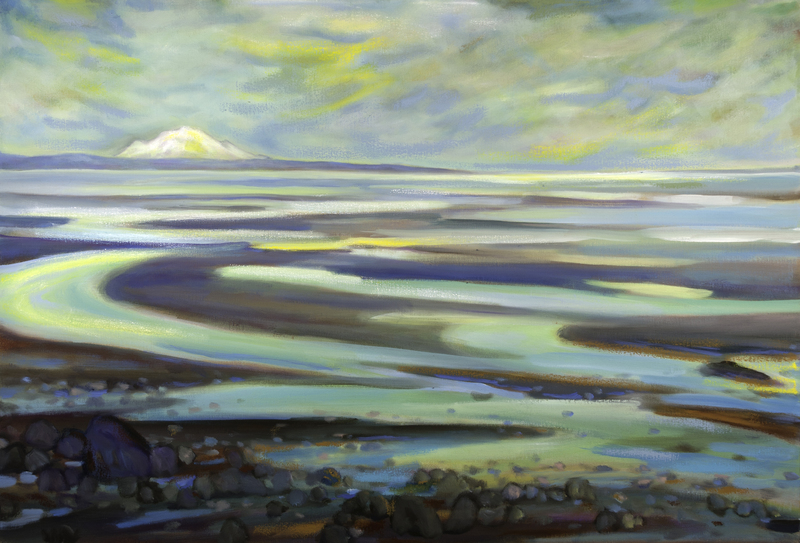 Influenced by Georgia O’Keeffe and the Group of Seven, she exhibits a keen sense of light and shadow, shapes and forms. She finds great inspiration in nature, especially the beauty of the British Columbia west coast. A few common recurring themes in her paintings are trees, mountains, river and lakes. Her concepts often germinate from a vivid mental image, then transformed on the painting surface. Lanta’s paintings have been exhibited at the Amelia Douglas Gallery, the New Westminster Cultural Crawl, the Van Dop Art Gallery and several New Westminster Artist Association group shows. Her paintings are widely collected in Canada and abroad. Enlarge “September at 70 Mile” Oil on Canvas | 30" x 40"
"Yellow Tugboat" | Oil on Canvas | 24" x 24"
"Canoes" | Acrylic | 30 x 30"
SOLD | “Twiglight Hour” Acrylic 18" x 36"
"Emerald Valley" | oil on canvas | 36" x 36"
“Yellow Tugboat” Oil on Canvas | 24" x 24"
Mud Bay and Mount Baker | 24" X 36"
"Backyard Creek" | Oil on canvas | 30" x 30 "
"Valley View" | Oil on canvas | 12" x 60 "